If you’re looking to give your home a unique and premium look, but don’t want to have to worry about repairing or replacing your roof again for decades, architectural shingles and dimensional shingles should be at the top of your list. If you’re looking for the contractor that delivers the best architectural shingles and dimensional shingles installation in Milwaukee and the surrounding areas, look no further than Community Roofing and Restoration. Architectural shingles and dimensional shingles are the same thing: premium roofing material that creates a distinctive and high-end look. 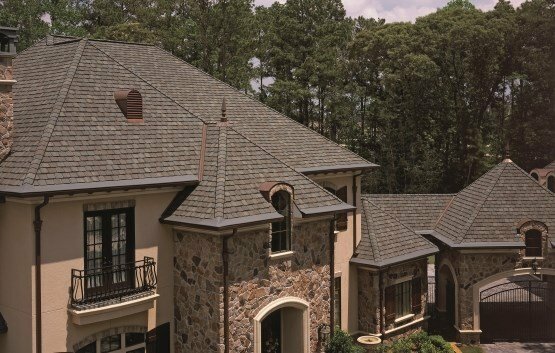 An installation of this type of shingle lives up to its name by giving your roof a dimensional appearance and enhancing the overall architectural appeal of your home. Architectural shingles and dimensional shingles deliver on this promise and also extend the life of your shingle installation over traditional shingles. For these reasons and more, these premium products are an excellent investment for any homeowner. Often composed of various shapes and sizes, architectural shingles and dimensional shingles give the roof a more interesting look that resembles cedar shake roofing but delivers long life and durability. They can be installed anywhere that typical shingles are used, and when installed by an experienced contractor such as Community Roofing and Restoration, the look that is achieved is stunning. Typical 3-tab shingles give the roof a more flat appearance and are thinner, usually needing replacement several years earlier than architectural shingles and dimensional shingles. 3-tab shingles have seen a decline in popularity because while the initial installation cost is often less than architectural shingles and dimensional shingles, the shorter lifespan decreases their overall value for consumers. Community Roofing and Restoration is proud to use CertainTeed products for our roofing projects. CertainTeed offers a wide variety of excellent quality architectural shingles and dimensional shingles. This allows us to give our customers choice in terms of color and appearance, ensuring the final result is unique and exceptional. For residential roofing materials, there is no better option available today than architectural shingles and dimensional shingles. Choose Community Roofing and Restoration for your roofing project, and you’ll have a beautiful new look for your home and reliable, long lasting protection for your life. Interested in either upgrading to architectural shingles and dimensional shingles, or is your current roof nearing the end of its life? We’re happy to stop by for an evaluation, answer all your questions and give you a free quote. Give us a call at 414-332-1139 or fill out our contact form today to schedule your free visit!